Do you travel with a family or a group of friends made up of 5 people? 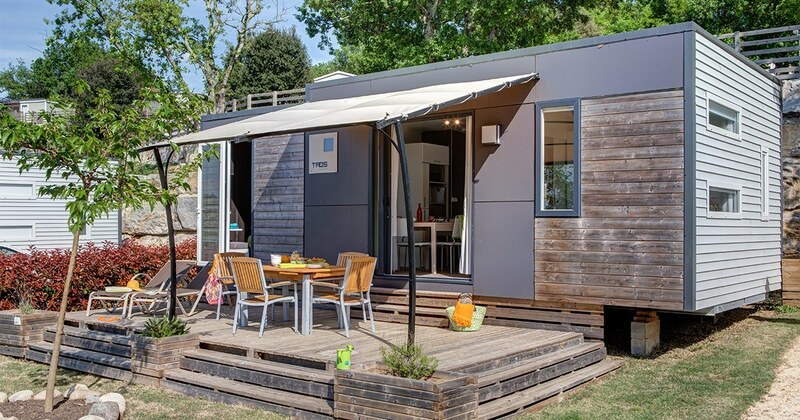 This mobil-home named the Sunêlia luxury Taos 5 people is for YOU. It is a modern shelter with a total surface area of 29 m2. It is spacious and well Equipped. It ensures a comfortable and pleasant stay for all those who choose it. In addition, if you opt for this hosting model, you will be entitled to several advantages. Here is more information about it. This model of Mobil-home has a large room with a double bed of 160 x 200. This one is perfect for the Parents. It also has another room with two single bunk beds and another single bed. This room is perfect for Children. It has a bathroom adjoining the room with a shower and a washbasin and a separate WC and a second ensuite bathroom with built-in wc. With these two bathrooms, there is no risk of queuing in the evening or in the morning to take a shower. So that the tenants can rest quietly, they have at their disposal a dining area stay. They can eat there or do family activities like board games etc. All members of the family can also meet to chat, to tell their day at the campsite, to organize the activities to do etc. The kitchen of this Sunêlia luxury Taos 5 People is an American equipped Kitchenette. It is also equipped with a dishwasher. Moms will be very comfortable preparing meals for their families. This accommodation is circled by Lawn. The tenants can rest there if they want an outdoor space to relax. Children can play there too. In addition to all the basic equipment available in this mobile home, It is also equipped with elements that may be particularly necessary for Tenants. The safe is One. It is especially necessary if you have valuables that you do not want to keep with you all the Time. It could be money, jewelry, paperwork etc. The mobile home is also equipped with a TV Station. It is therefore possible to look at various Programs. There is also a Nickelodeon tablet. To benefit from the latter, a certain amount must be deposited as a deposit. It contains videos and applications for Children. If you opt for this mobile home, you can have beds made daily, sheets, bath mats and clean towels. A bottle of champagne at the expense is also available to the Residents. The reservation of a household at the end of the stay frees the residents from household stains before returning Home. As for pets, they are welcome if they are off first and second category Dogs. You also have to pay a supplement of 6 €/day for each animal.